Redwood National Park and the Northern California area is best known for its massive, majestic and imposing redwood trees. While these trees are certainly the most famous, they are not the only plant species that thrive in the area. There are thousands of different shrubs, grasses, and trees that make up the picturesque land of Northern California. While most of these plants are healthy and strong, one type of tree, the majestic tanoak, is in trouble. A pathogen known as Phytophthora ramorum, or more commonly called Sudden Oak Death, has been sweeping through Redwood National Park since July of this year, killing up to 100 percent of tanoak trees in its wake. 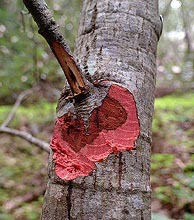 Cankers causing a tanoak tree to bleed (Photo courtesy of the University of California Division of Agriculture and Natural Resources). The disease has been around California since 1994, but the first cases of SOD appeared in Redwood National Park just this year. It is likely that the disease originated from Southeast Asia. Because of this, tanoak trees have absolutely zero resistance to the disease and die quickly after exposure. SOD is an especially tricky disease due to the fact that the spores are spread by air currents and thrive in creeks. 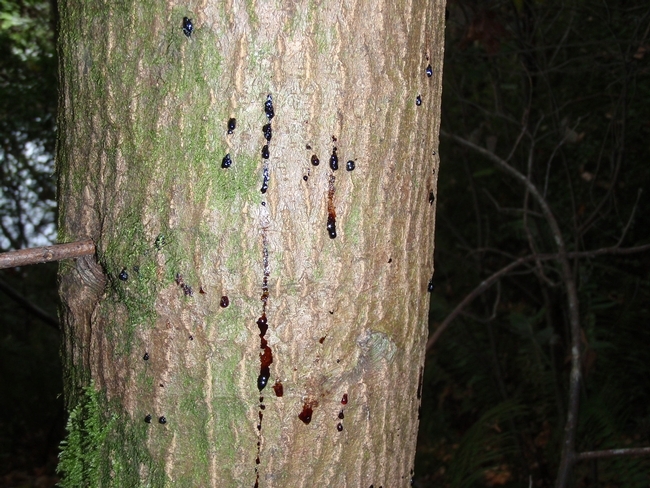 Because of this, the pathogen can be dispersed quickly and leave lethal cankers on the tree. It is not enough to simply transfer trees either, as planting infected trees can increase the risk of disease spread exponentially. Click on the video at left to view an audio slideshow about sudden oak death in tanoak trees prepared by writer Dylan Weems. Even Leonel Arguello, chief of Vegetation Management at Redwood National Park, is skeptical when it comes to the chances that the park has of eradicating the disease. This “on the ground management” includes completely clearing out all tanoak trees within a 30-foot radius of an infected tree. Redwood National Park hopes that isolation will slow and eventually stop the spread of the disease entirely. 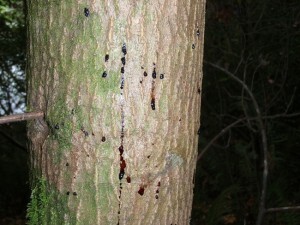 Diseased and healthy tanoak bark (Photo courtesy of the Planet Management Network). If SOD is not stopped, then there could be dire consequences for Redwood National Park, Northern California and even southern Oregon. Acorns may seem insignificant, but a mature tanoak tree can produce more than 1,000 pounds of acorns that are meant to feed a variety of forest creatures. Without these acorns, the food web of Redwood National Park could be thrown off and many species of animals would struggle to survive. This issue has also caught the attention of the Bureau of Land Management in Northern California, which discovered the disease two years ago in Lack’s Creek, an area in the Park Protection Zone. The BLM was given more than $100,000 to fight the pathogen. Chris Heppe, the acting field office manager for Arcata, Calif., has implemented a unique strategy to try and destroy SOD in the area. Dan Wooden, forester for the Arcata Field Office, tends to agree. Clearing out whole sections of a forest can harm the land. Not only will pulling up the roots of trees have an effect on the integrity of the soil, but the machinery involved in removal also can disrupt the wildlife and drive them from their homes. Cankers on dead tanoak leaves (Photo courtesy of the Planet Management Network). In order to detect the SOD pathogen, both Redwood National Park and the BLM place leaf traps in rivers. These large mesh bags are filled with various types of leaves and tested periodically for many different diseases. The officials of the parks can then determine just how far the disease has spread and then determine the best course of action to take. Luckily, the efforts of both the Bureau of Land Management and Redwood National Park have been beneficial. The latest models from the University of California-Berkeley show that the spread of Sudden Oak Death has slowed down. The parks can only hope that their efforts will eventually stop it entirely. If you would like more information on Sudden Oak Death and what you can do to help, visit http://www.suddenoakdeath.org.